Well, as most know, we headed to the ER yesterday late afternoon. We called, they said come to ER. Although, I then reminded myself of July, 2011, when I SHOULD have gone to the ER the night before, but didn’t, and we ended up being life-flighted in and CPR and on the ventilator. That said, we got here and she was a little better. Not coughing so much, but super cranky. Still on oxygen all the time vs just at night. Her ears were “bulging” when ER doc checked them. Not necessarily normal 4 days post starting antibiotic. She skipped one feed yesterday, handled her 10 pm feed okay (gagged but no puking.) But she threw up half-way through her morning feed, and is still having super watery stool. But her heart rate is better this morning. She did test positive for RSV (even though she gets once-a-month shots to prevent it, ugh!) so our assumption is all of this has been due to that. Um, what else… labs came back decent, although her anti-rejection med level was WAY low, which concerns me. GI also plans to consult us as inpatient today on our weight issues, I think they figure we’re here anyway, and I’m okay with that. Unsure how long we’ll be there… at least staying another day. Being in the hospital is SO much different this time. Annabelle no longer sits still. 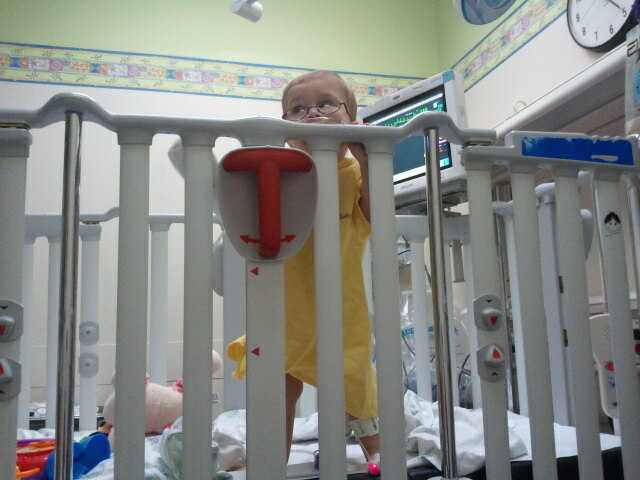 She stands up, cruises around the crib, tangling her cords like crazy the whole time. It’s sad but funny! She was NOT NOT NOT pleased about getting her IV. Tried to take it off and I had to hold her down until she gave in to not messing with her no-no. Now she just hits everything with her club. As I type, she’s doing really good. Heart rate is finally down and level (110.) Sats are great at 94/95 (on 1/4 liter of oxygen though.) And she’s sleeping soundly, and they are calling report to move us to a regular room, which will be MUCH better than the ER. SO thankful I packed my bag yesterday morning “just in case.” I forgot a few things, but nothing hugely important. (i.e. pretty blankets, HA!) But I DID grab my Valentine’s Day candy Scott had got me… so that has been helpful! Also grabbed a few slimfast bars, HELLO dinner and breakfast last night and this morning! Okay, they are getting read to move us up! Will update when I know anything more. THANK YOU THANK YOU for all your prayers! I REALLY appreciate them! Praying for the Phillips Family, get well fast Annabelle! praying for Annabelle!! and also praying for your family!! Praying for Annabelle to get better soon!! Awwww! So sorry to hear you're in the hospital! Guess Annabelle got wind of her friend's plight!! Praying you and Anna Reese will be home and healthy very soon. Lifted Annabelle and her medical team in prayer, along with you and the rest of your family. Praying for y'all! RSV really does stink. Just lifted you all up in prayer. 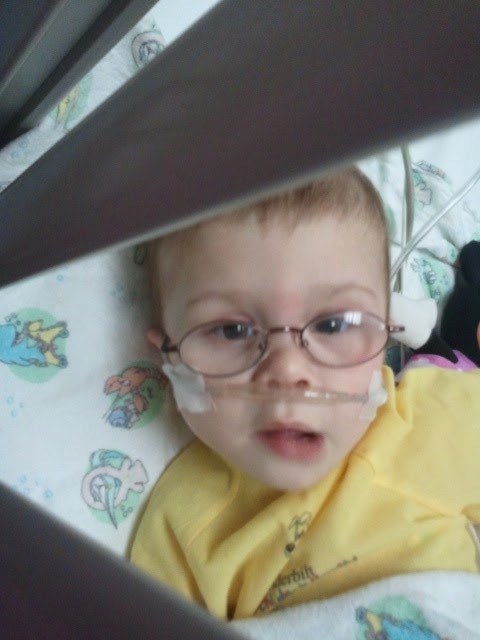 I know several babies/young ones dealing with RSV right now. 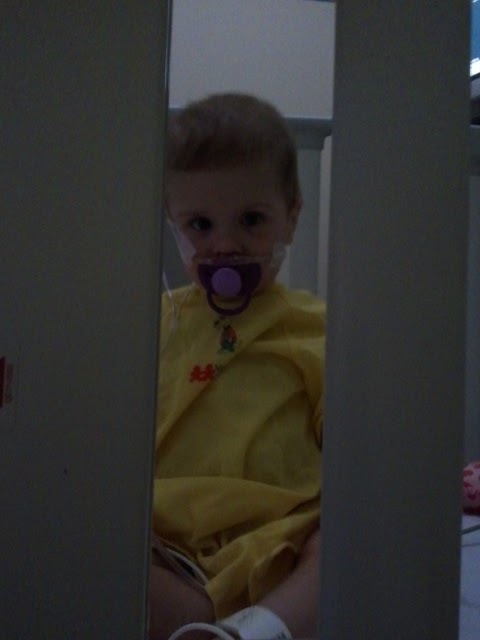 So hard on Annabelle with her reduced immune system already. Prayers for quick healing and for your whole family. Praying for little Annabelle and for the whole family. I just caught up with all the news. I had to look up RSV … I'm such an ignoramus, lol. I'm praying for you all! !